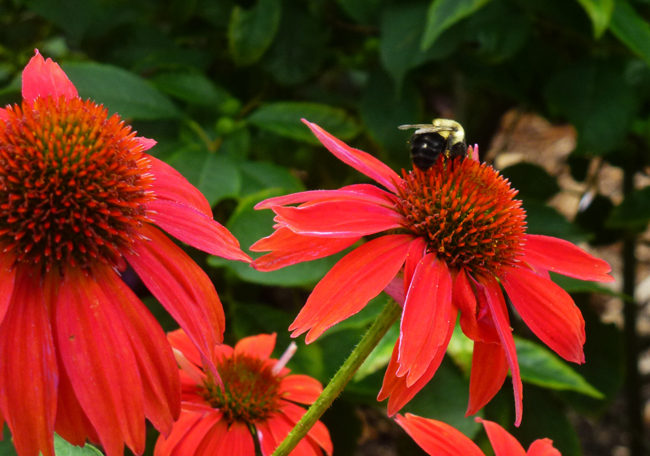 I wasn't the only creature liking these wonderful red coneflowers. This bee spent several minutes visiting each of the blossoms in this bunch. It is so nice to see a bee since it really seems that there are fewer of them around this year. About the Raccoon on my blog - I think it is a female with babies. As soon as she weans them she will fatten up for winter. It is good to see them. I was watching a couple of them hard at work this morning. Beautiful flowers and it's always nice to see the bees at work. Hello, I like the red coneflowers. Usually I see the purple colored ones, it nice to see all the colors. Thank you for linking up and sharing your post. Happy Saturday, enjoy your weekend! I love your good photos, this clever title and YOU! I saw a few bees here too today checking out some fuchsia. Anything bee-friendly is a winner for me. These are beautiful. Great shot. I'm trying to plant more bee friendly flowers. Great title on this great picture. Oh, I haven't seen red ones! Stunning. I have got exactly the same feeling. But I must say that after a few years I saw some bees in our garden too. Hope they will be recover. Vivid color and so happy that bees are attracted to the flowers! We need to encourage anything that encourages the life of bees. Don't you love it when the bees are happy with the flowers around...then you know there is something truly right and wonderful in the world in spite of everything! Beautiful flowers, too...have never seen a red coneflower. I like seeing busy bees at work! I have intentionally been growing flowers that attract bees and butterflies. My garden is swarming with bees and butterflies and it looks good and healthy.